Lately I've seen lots of online slot games that claim to be "3D". Yes, they are beautifully illustrated with three dimensional images, but they don't require 3D glasses and they aren't what I'd call "real" 3D. 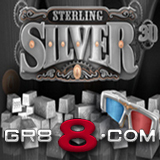 But then there's the new Sterling Silver at GR88 Casino -- the world's first truly 3D online slot game! Sterling Silver is a 5-reel video slot with 25 pay lines and a Free Spins Feature with a 2x multiplier. The stacked Wild multipliers are random, from 2x to 10x. There’s also a Gamble Feature where wins can be doubled or quadrupled. The artwork is positively dripping with glistening silver symbols like the Sterling Silver Wild, a stacked wild that awards multipliers from 2x to 10x, even during Free Spin cycles. The Sterling Silver Scatter can trigger up to 15 Free Spins. With a betting range of 0.01 to 0.25 a line, a maximum bet of 31.25 can deliver up to 40,000 in the base game and double that in Free Spins. GR88’s New Years Resolution Bonuses continue until the end of the month. Players are choosing resolutions and receiving up to 100% bonuses. You can pick your resolutions and unlock your bonus at http://offers.gr88.com/newyear. Thanks for your update If you want to get aware about some other tricks or you want to play Free Online Slot Games please visit Free Slots Planet.